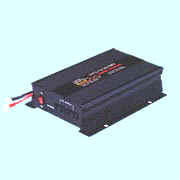 Inexpensive inverter rated at 600 Watts, includes battery charger for use independent of vehicles. 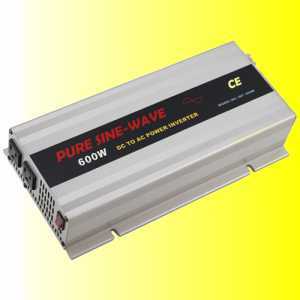 For Retail Inverter Sales Click Here. Low standby and overhead currents - approx. 0.3 amps. This means that it can be used for small loads as well as large loads with efficient use of battery capacity. Many competitive designs require 6 or 7 amps just for the overhead when run at low powers. The unique high surge capacity, ensures that this small inverter is capable of starting the heaviest requirements, i.e. domestic refrigerator compressors, and computer monitors (which usually require a 1500 watt inverter just for the start-up surge), high power hand drills, other hand tools and other domestic equipment. Minimum order 200 pieces. Samples available. Output voltage regulation ± 10% max. Standby current 0.9A max. 0.4A max. Inexpensive inverter with built-in charger. Low cost. $68.95 in quantities of 5000. Minimum order 200 pieces. Samples available.